All transactions are safe and secure with a reliable history in online purchasing behind each of our associates. Buy the Catching Fire Katniss Nouveau t-shirt to own Hunger Games clothing and merchandise. 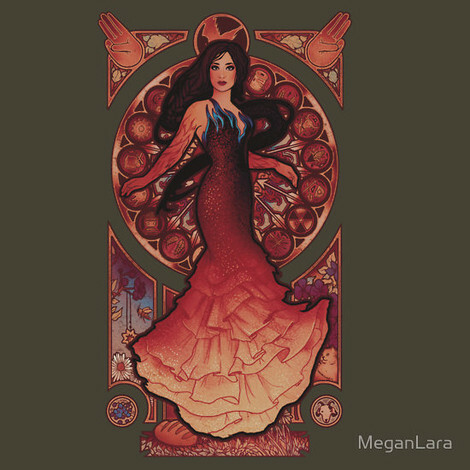 As part of its eye-catching design, the front of this Hunger Games tee features a dazzling portrait of Katniss Everdeen inspired by Catching Fire. The design features a fiery Katniss surrounded by logos for each of the Districts from the movie. A Mockingjay symbol appears behind her head and a loaf of bread rests at her feet. Whether you imagine yourself hailing from District 11 like Rue or 12 like the heroine herself, this impressive t-shirt will have the mockingjays singing the contagious notes of rebellion. In addition to the Catching Fire Katniss Nouveau tee above, browse the Hunger Games Clothing Gallery for more apparel like men's and women's clothes, kids shirts or hoodies.